Wales midfielder Joe Allen says he is not interested in the squad being tagged a "golden generation." Chris Coleman's side begin their Euro 2016 qualifying campaign against Andorra on 9 September. 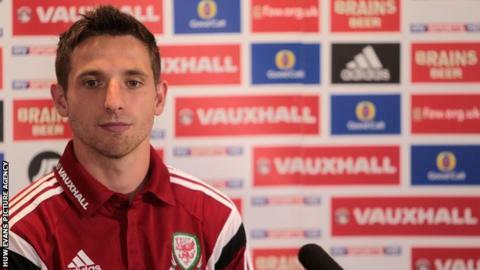 Allen says Gareth Bale and Aaron Ramsey add more talent to the squad, but their focus is on making the finals. "We're really hitting our peak with good experience and that's why we're so excited to get this campaign under way," he said. Should Chris Coleman's team qualify from Group B, they would become the first Welsh team to feature in a finals tournament since the 1958 World Cup. After their opener, Wales play two fixtures at home against Bosnia-Hercegovina and Cyprus on 10 and 13 October before facing World Cup quarter finalists Belgium away on 16 November. Liverpool midfielder Allen, 24, said: "We obviously know that there's quality in the squad, I think a lot of the players have been together for quite a long time as a group which makes us feel like we've got a great chance. "I think the 'golden generation' is a matter of opinion for some people and for other people to discuss. We try not to focus too much on that." There had been doubts as to where the Andorra match was going to be played until the hosts' new artificial 3G pitch passed an inspection. But Allen insists Wales have not been distracted by uncertainty over the venue and the prospect of playing on an artificial surface. "We would prefer to play on grass," said Allen. "But we've all played on artificial surfaces enough times to know what to expect. I can't see it being a major problem really." Hosts France qualify automatically for Euro 2016 and will be joined by another 23 nations, an increase from 16 in the current format. The top two teams in each of the nine groups will reach the tournament finals along with the best third-placed finisher, while the remaining eight third-placed teams go into play-offs in November 2015. Former Swansea player Allen believes the greater number of teams able to qualify and having the likes of Arsenal's Ramsey and Real Madrid's Bale in their ranks will help Wales' bid. "The change in the amount of teams that qualify has given us a boost," he said. "That, coupled with the players we've got, we are really confident we can hit the ground running."